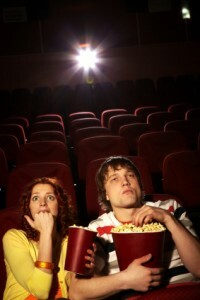 New couple, Emily and Brock, are at a movie theater about to watch a horror movie. As the lights dim and the movie is about to begin, Emily grabs Brock’s arm. Emily apologizes and lets go of Brock’s arm. When the opening credits of the horror movie begin, Emily grabs Brock’s thigh. Emily apologizes and lets go of his thigh. 5 minutes later, Emily screams, “Oh my God!” and grabs Brock around the neck. “Oh my God!” she screams again, holding onto Brock’s neck as the horror movie’s characters are being introduced. When the real horror starts and the horror movie’s characters are being torn apart by a chainsaw wielding madman, Emily calms down and feels much better.